I used to really be a reader. I was almost always in the middle of 3 books at a time. I still love to read, but I can't seem to find the time to do it! I used to read at the gym. I hardly ever go to the gym anymore. I used to read in bed before I fell asleep. Now, after I get M in the bed, I'm alseep within minutes! I do have little chances here and there to read during the day. On the metro, on the way home. But, because it's been so cold lately, I've been driving to work more. Can't read and drive! Sometimes I get about 5 minutes to read while M brushes his teeth, etc. when we're getting ready for bed. And that's nice. But, seriously. It's a shame. I've been reading President George W. Bush's book, which I actually really enjoy, for months. For Christmas, I got a Kindle. I think I've blogged a little bit about how much I loved Shauna Niequist's "Bittersweet." Such truth, I tell you! You have to read it. And "Cold Tangerines" too. She is an amazing writer! 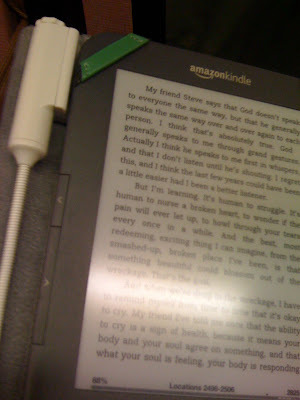 I breezed through that book, in part, I believe, because it was fun to read my first Kindle book! Also, because I was like a little sponge soaking it up! I went to California last weekend for a work trip, and I took our pastor, Mark Batterson's new book, "Soulprint." He and his wife gave each person at National Community Church a copy! All of Pastor Mark's books are easy to read and understand and have a lot of practical application for living your life for Christ. I was a sponge, yet again! I think I underlined half of the book! It's all about finding your identity in Christ. Something I have realized this struggle I've gone through over the last year or so is really all about. This book was for me. And I read it at just the right time. You should read it, too. Especially if you find yourself trying to strive and prove that you are this, that or the other, and trying to live up to your own expectations you cook up! The truth: we are all unique. We are all created by God. He loves each and every one of us! We are free to live and be ourselves in that love and grace. 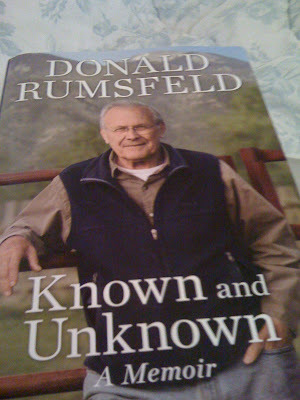 Now, my next book (after I finish GWB's book, which I hope to do this weekend*) will be former Secretary of Defense Donald Rumsfeld's book. 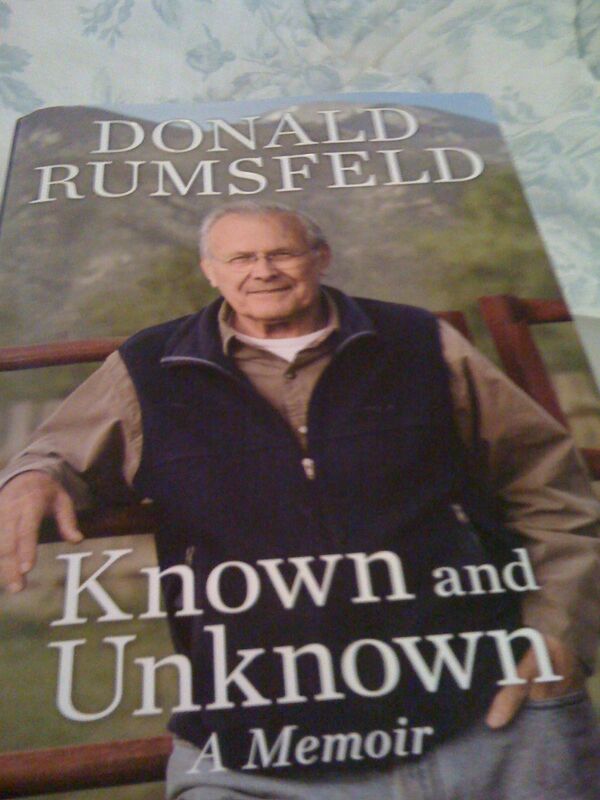 I recently shared an elevator with Donald Rumsfeld! He was at the building where I work for an interview with some other media organization. We parked our cars in the parking garage, I showed him in, we shared the elevator, and I saw him off to the lobby. He is quite controversial still, but I don't think you can deny that he has led an incredibly full life of public service in high places for the last 50 YEARS or so! I read that he took 4 years to write the book. Hopfefully I won't take that long to read it. Hey, let us know what you think of Rumsfield's book. I'm debating about ordering it. I got a Kindle for Christmas too and I'm really having fun with it, but I'm still a sucker for the old fashioned book-in-hand. LOVED GWB's book! It made me really appreciate the man behind all the crazy hype. I love that he's so down to earth. Okay, obviously I'm a book lover too. I'll stop now! Love your posts, m'dear! !